A coastal walk featuring beaches, rocky headlands, cliff-top views over the Bay and abundant birdlife. An ideal time to do the walk is early on a sunny morning. From the Visitor Centre, facing the sea, turn left and follow the waterfront, either by following the road above the headland or by walking round the beach if the tide is low. Follow the broad sweep of Te Ti Beach, Paihia’s most popular recreation beach. Depending on weather conditions you may see people picnicking, swimming, sunbathing, surfing, water skiing, fishing, kite surfing or wind surfing. On your left as you cross the Waitangi River bridge is the “Tui”, a shipwreck museum and café housing some of the treasure recovered by well-known diver, the late Kelly Tarlton. 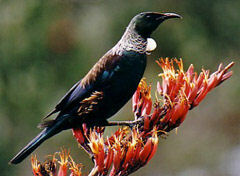 The “Tui” has had a colourful history, beginning life in 1917 as a sugar lighter for the Chelsea Sugar Refinery in Auckland. She was also used as a houseboat for a time. Paihia’s main boat launching ramp is on your left at the northern end of the bridge. In summer it is a bustling scene from before dawn as fishing enthusiasts launch their craft. On your right is the Copthorne Resort Hotel. Follow the shoreline around the front of the hotel and up the track to the Waitangi National Trust grounds. There is a charge to enter the gardens and the Treaty House but there is no charge to follow the cliff top walk which is part of the coastal track. The track follows the cliff top for a few hundred metres past the Treaty House and skirts the Waitangi Golf Club. 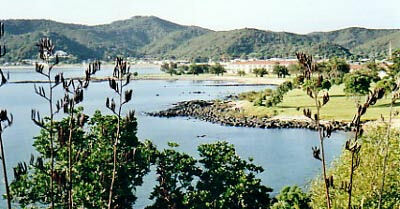 It offers views across the Bay to Russell, Tapeka Point and out to the Ninepin Rock. Huge old pohutukawa trees cling to the cliffs. 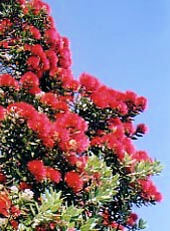 The pohutukawa is known as the New Zealand Christmas tree and in early summer is covered in feathery red blossom making a ribbon of red along the shoreline. The coastal track continues past a small rocky beach. The distinctive black rocks are pillow lava rock that has fractured into hexagonal shapes as it erupted under water. By contrast, the sand is almost pink in colour and photographers will find many scenes worthy of their attention. Rest here a while and you will gain an impression of what the bay was like before it became a busy tourist Mecca. From here the track skirts the 13th and 12th holes of the Waitangi Gold Course and ends on a rocky headland looking north along the coast towards Moturoa Island and the entrance to the Kerikeri Inlet. The rocks here are popular for fishing. pitched call. 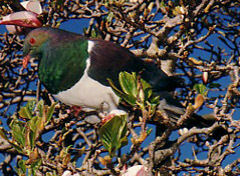 Other birds often seen are tui, wax eyes, parakeets, native pigeon (keruru), kingfishers, shags, (cormorants), oystercatchers, gannets and pied stilts. On the grassy stretches, chirping fantails often flutter about you as you walk, chasing after insects disturbed by your presence. At the end of your walk you have a number of choices. Picnic under a pohutukawa or visit the historic Waitangi Treaty House, wharenui (Maori meeting house) or waka (Maori war canoe). Stop for refreshments at the Waikokupu Café, nestled amongst native trees in the Treaty Grounds. Then, either retrace your steps or return to Paihia by taxi.